Hello there! Are you curious about why everyone is so excited about Blumaroos? Do you know of any famous Blumaroos? If not, you have come to the right place! Blumaroo Day is a celebration dedicated to this awesome species and there are many Blumaroo Neopians, items, avatars, and battledome equipment. 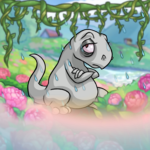 Instead of trying to incorporate everything about Blumaroos into one article, I will touch on some of the more famous Blumaroo Neopians. Whether they are the main character of a game, an arrogant gamer, or someone in a position of power, it is important that you learn about these famous Blumaroos! Rohane – Rohane is the main character in the addicting game Neoquest II. Rohane's mother, also a Blumaroo, is a noted character in the game. Traverse through the worlds of Neopia taking down villains and various enemies and try and take down Terask *cough* twice *cough. * Make sure you hold on to your father's sword, though. It may seem useless and only takes up space in the beginning of the game, but I hear it works well near the end. Rohane and his mother can be found on stamps and plushies. Watch out for the Plains Lupes! King Roo - Not much attention is given towards King Roo over on Roo Island, but that does not mean you should not know important things about him! Ever wonder where Dice-A-Roo came from? According to the Neopedia article about King Roo, a strange Blumaroo dropped them off when King Roo after a failed attempt by others to entertain him. The rest is history. Whenever you hit the jackpot, just remember to thank good ol' King Roo (and that strange Blumaroo). Also, you might want to thank Advisor Broo, another Blumaroo, for holding down the castle while King Roo obsesses over the dice game! Commander Garoo - *dodges Commander Garoos Battle Axe* PHEW! That was a close one. This Blumaroo has been a favorite of mine for quite some time. Commander Garoo is a valiant fighter in the Battledome and can be found in the Neocola Centre hanging out with the Space Faerie. Commander Garoo is fairly well known, and also is on a stamp (an expensive one, too!). Known for his allegiance to the dangerous Dr. Sloth and harsh temper, Commander Garoo could be considered one of the more dangerous villains in Neopia. Watch out for him in the Battledome, but also lurking in the shadows. Count Von Roo – It's starting to get late and things are getting a little spooky over on Roo Island. While King Roo is fast asleep, Count Von Roo is just waiting for the right time to wake up and great eager Neopians trying to sneak a peak. Be careful when you visit Von Roo as your Neopet might leave a little weaker. When the vampire is not tucked away in his castle. Von Roo is another popular Blumaroo that is referenced in the form of plushies, images on stamps, and even a gnome! Lilo Blumario – If you are an avid fan of the Altador Cup, you probably already know this scoring-phenom. Lilo is one of the more dynamic players on Roo Island's Altador Cup team. Even though Roo Island had a rough finish this year, they still have next year to look forward to. As someone to typically supports Krawk Island, Lilo is still a player that continues to impress me with their ability to score. Lilo is described as a leader and a clutch performer. Even though Lilo struggles with jumping and may not be the strongest player, he still has a ton of heart. Make sure to keep an eye out for this Blumaroo's bright future. Aristotle A. Avinroo (AAA) – Oh, Aristotle. Even at such a young age, this gaming star has continued to turn heads in the game room. AAA"s arrogance sometimes gets in the way of his success, but he is still a force to be reckoned with. Introduced in 2006, AAA's gaming skills have only gotten better. Look out for him again in the next few months. Through the Daily Dare and the Games Master Challenge, AAA is always busy getting better and better, and also reminding us that he thinks he is the best. I'm sure having his name in the Neopian Times will not help his ego much though! King Roothless – One look at this Blumaroo and heads will be turning away in disgust. First seen in 2008, King Roothless was accused of kidnapping Aristotle and his sister Abigail in order to show Neopians that he was the best in the Games Room. If you would like to re-live the tale, head over to the Games Room and play Dungeon Dash. Horace – Horace can be found alongside his friend Zina in Ruins Rampage. Originally a part of the Lost Desert Plot, Horace was a part of the Desert Scarabs. This plot was before my time so unfortunately I cannot speak too much about Horace. If you are like me and aren't as familiar with the Lost Desert Plot, I encourage you to research about it's history as it was an important time. Chef Bonju – Remember that avatar that took FOREVER to figure out? No, not the Wishing Well avatar. I obviously cannot tell you how to obtain this avatar, but if you are not familiar with this avatar, please know that many grueling months were spent trying to figure out the solution to this avatar. With Chef Bonju on the cover of this avatar, make sure you try and add this one to your collection. Don't worry though, I overheard some other Neopians heading to Mystery Island to check out what the fuss is all about! Maybe you should follow them! Thanks for taking the time to read about the famous Neopians that are Blumaroos. I am sure that I have missed some notable Blumaroos, but in the interest of time and space, I leave the further research up to you. I hope this article has sparked your interests. Who knows, maybe we will see a rapid increase in Blumaroo adoptions, galleries, and fanfare!